The location was the hidden valley of Deer Park Monastery near San Diego, California. 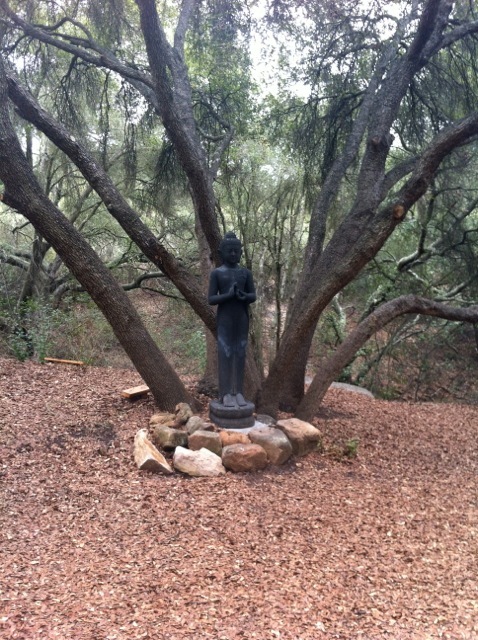 This 500-acre sanctuary provided the space for about 60 dharma teachers to meet for five days in early June. The weather was perfect, the sharing intimate, the facilitation exceptional, and the practice grounded. The dharma teachers came from Theravada, Ekayana, Mahayana, Vajrayana, and Triratna streams bringing a richness of experience to our gathering and conversation. Though the gathering was located at Deer Park Monastery, this gathering was organized and facilitated by a team of five dharma teachers from each of these lineages. Much gratitude to the monastics of Deer Park for opening up their home for our practice. As active dharma teachers in a tradition of Buddhadharma offering refuge in the Three Jewels, we gathered as a continuation of a similar retreat at the Garrison Institute in 2011. We came together to share our experience, and support each other, as young dharma teachers (born between 1960-1980) teaching western Buddhism. The intent was to connect teachers for whom Dharma teaching is a (or the) significant life activity, whether through teaching retreats, guiding a Buddhist temple, or other format. Being together demonstrated that we are truly a community of teachers and not independent nor separate because of our tradition. We need not teach in isolation and can support one another in our practice and teachings. Our teaching experience ranged from one year to twenty-five years, including lay and monastics teachers, those who live in community and those who work full-time outside of the dharma practice, and represented Canada, Korea, United States, and the United Kingdom. The gathering had a “conference” feel to it and we spent a great deal of time in dialogue rather than in meditation and practice. Being a newer dharma teacher, I arrived with a my own nervousness on what to expect from being with 60+ other teachers. From the very first mindful mingling activity, I felt a connection and knew that I was in a community of like-minded dharma sisters and brothers. We were ably guided by a group of four teachers who made it easy to participate and feel included. I came away with this word on my mind to describe this gathering: inclusive. Inclusive in terms of practice streams, voices being heard, needs being expressed, and topics being explored. We used a crowdsourcing, the practice of obtaining ideas by soliciting contributions from a large group of people, to determine the best ideas for group exploration and had many “open space” time slots to delve deeply into the topics that most interest us as teachers. This was accomplished first by each individual writing down an idea on a piece of paper. Second, we randomly moved about the room and exchanged the idea with another person who then scored the idea before we randomly moved around the room again to exchange ideas. In the end we scored the ideas and had our top ideas for discussion. We co-created this gathering together. Within each of these general areas, more specific topics emerged such as patriarchy, privilege, ethics, teacher accountability, scholarship, dating, recovery, trauma, sexuality, race, faith, balance, gender, LGBTQ, and teaching tips. One of the great tools used during the retreat was creating space for every voice to be heard. We met in large groups, small groups, triades, and in twos. The “water cooler” conversation was thriving throughout the retreat. The most significant work for me during this gathering was observing my mind. It is so easy to allow judgement to arise and to get caught by my ideas of how people “should practice” and how people “should teach”. These feelings were particularly acute because Deer Park is a second home for me, and yet many of our regular Plum Village practices were not recognized or used during these five days. All my ideas of how things “should be” came rapidly to the surface, only to be let go with each breath. If I can’t let go, there is a huge barrier and that severely impacts my relationships with others. This retreat offered me an opportunity to grow in the area of group participation. I come away from the gathering feeling supported, hopeful, inspired and grounded. I have a deeper commitment to my teaching activities along with an awareness of the community of teachers outside my tradition that I can call upon, and learn from, throughout the years. I have a deeper understanding of what my brothers and sisters are doing and how we inter-are with each other. I also have hope for bringing this experience to the 64 active Tiep Hien Dharma Teachers in North America. Thanks for your insight. I am sure it will mean much for all in the four-fold sangha. The fruits of the practice – deep and lovely. Thank you to all the dharma teachers and to you Kenley for sharing.